Cross infection to client from sling. c. Check there is enough space to move hoist along ceiling track at every step of task, remove any obstacles or tripping hazards. d. Always move in same direction as hoist when walking with it, do not twist. e. Only use client's sling, making sure it is clean, instructions on it readable and is the correct sling for the task. 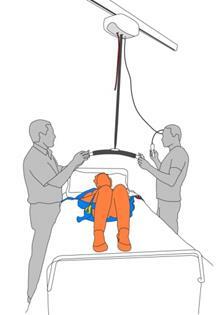 This instruction uses a full body sling as the example. Check the hoist is plugged in, turned on and in good condition. Check extendable strap is not twisted. If any faults, report immediately and do not use. Check the hoist (hooks, spreader bar) and sling for signs of wear or damage. If any faults, report immediately and do not use. Make sure hoist is ready for operation. 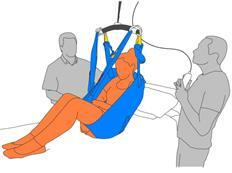 Assist client to roll to side and set the sling in place. When client is on their side, place sling along back, make sure pelvic opening is level with middle of buttocks (applies to full body sling only). Prepare sling for attachment to ceiling hoist. Position the hoist and lower the spreader bar. Bring hoist along ceiling track until directly over client. One worker lowers spreader bar using hoist controls. Workers on either side guide spreader bar into position, keeping parts away from client's head. Raise client with ceiling hoist and sling. Move client with ceiling hoist. When client is clear above bed, activate hoist to move them away from bed. 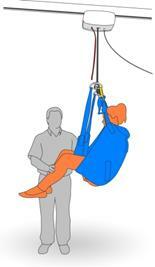 Slowly push client in sling to new location, move with direction of hoist, and do not twist. Again, make sure the area is free of hazards. 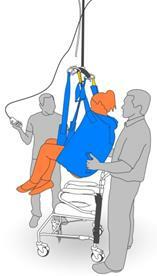 Second worker supports then pivots client in sling, so they are correctly above the chair and ready to be lowered. Lower client with portable hoist. If using a commode chair or wheelchair, make sure brakes are on. Worker operating hoist uses controls to lower client. Both workers guide sling so that client is positioned to back of chair, making sure not to take any weight. Unhook sling when it is relaxed; keep control of spreader bar to avoid hitting client. Make sure client is comfortable and secure. Put ceiling hoist away at start of track, with control secure.